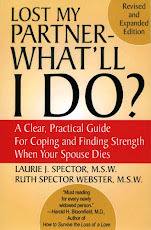 You’ve just lost your spouse/partner. Now you may face more losses. If your spouse/partner had adult children, how can you be certain those relationships won’t either slip away or be destroyed by conflict? -Your step-children are grieving too. Their reactions will reflect their own relationships with their deceased parent. If there was conflict, there may be hidden guilt or remorse behind how they act. -Your connection with your step-children depends on how you have been in their lives and what kind of relationship you shared. If there was any initial tension around the circumstances of your marriage, this can surface. -Is your spouse’s ex alive? Your step-children may distance themselves from you. Keep in mind that what appears to be a shift in loyalties may just be a temporary reaction to the loss. -Consider your connection prior to the death. Were you close to your step-children? What stresses did the circumstances prior to the death (prolonged illness, a sudden accident), put on the relationship? Hopefully these questions can shed some light on what lies beneath any tensions or confusion you may have experienced with your stepchildren. In our next post, we’ll offer some strategies for strengthening these important relationships during this difficult time. I was very close to my husband's daughter and her family. After he died, there was a shift in my relationship with them. It was a "loss" I didn't see coming. If you think, as I did, "this will never happen to us", trust me it can, even in the best of circumstances. When you factor in the emotional issues, as well as the financial and legal ramifications, it can "shmurgle" your relationships. Perceptions of reality and entitlement can become very skewed, which is why I made sure I got excellent legal and financial advice. I also remind myself daily that I am not reaponsible for what anyone else says, does, or thinks. Patience and faith are invaluable. As I have said in my other posts, "buckle up"-you just never know where this journey will take you. Thanks for your excellent comment, Deb! Your point about getting your own legal and financial advice is especially useful.